Sometimes we all need that extra helping hand in the kitchen. The person to chop a few veggies while we prepare the sauce or blend that sauce as we plate up. If, like me, you love your kitchen gadgets, you will already have drawers full of different chopping, blending and shredding devices. Shopping channels have made a fortune over the years from me! A food processor can replace many of those rarely used gadgets and speed up your cooking time. If you are unsure of your knife skills, you can get attachments for food processors that will chop, julienne, shred or slice ingredients any way you want. Using a food processor can make even the most elaborate dishes easier and more fun to prepare. If you are unsure what a food processor does or what features you should be looking for, you have come to the right place. In this article we will look at the many things you can achieve with a food processor, which features you may need and choose five of our favorite food processors currently available. The first food processor was produced in Germany in the late 1940s. It wasn’t until 1973 that Magimix food processors were introduced to the USA under the brand Cuisinart, the company who still manufactures many of the best rated food processors today. I got my first food processor in the eighties when at college and ever since haven’t been able to live without one. Food processors are valuable small appliances that can save so much time for you in the kitchen and reduce the number of tedious tasks you have to perform. Some food processors can also make fruit or vegetable juices, help whip up a cake batter, make nut butters and do the laborious kneading of bread dough. Most food processors consist of a work bowl that attaches to a base unit with a motorized driveshaft. The bowl can vary in size and may have a feed tube which allows food to be inserted with the blades running, to be chopped, shredded or diced. Many processors come with an S-shaped blade and discs you can attach for slicing or shredding. Other attachments can include a whisk or emulsifying disk, julienne discs or even a citrus juicer. Make dips, emulsions including mayonnaise, vinaigrettes and blend sauces. And many more time saving food prep techniques. Modern food processors can be a real asset to any kitchen and make your food prep more efficient and enjoyable too. If you often cater for larger dinner parties, a quality food processor will soon pay for itself with the time and money it saves you. Instead of buying those ready prepared vegetables or salads you can now make them almost as quick as you can open the bags. The following YouTube video shows how easy it is to make dough in a food processor. If you have never used a food processor before, you may be unsure where to start when choosing one that best fits your needs. Here is a quick guide to point you in the right direction that looks at some key aspects you should focus on when choosing the best food processor for your kitchen. Perhaps the most important consideration is the size of the work bowl on your new food processor. Most experts would agree that a 10 to 14-cup bowl is the most useful for home cooks, especially if you have a larger family. Smaller bowls are available for those with limited space or smaller tasks. Some models may even contain two or more different sized bowls for various jobs, but these will also need additional blades to be included. If you intend to make bread dough in your food processor, a larger bowl size will come in handy. For simple tasks like making sauces or pureeing baby food, a mini food processor or chopper may be more convenient. Mini food processors can have bowl sizes that range from 1½ cups to 6 cups, but most of the best small food processors tend to be around the 3-cup mark. The size and weight of the base unit can also be a deciding factor. Larger motors can weigh more and be difficult to store between uses—make sure you have the countertop space to leave it out but also to store the attachments. More lightweight units may be easier to store but a lighter housing will make the motor noisier in operation. The blades and any included accessories will play a key part in the performance of your processor. Stainless steel quality S-blades (Sabatier blades) that are durable and easy to clean will ensure years of trouble-free food processing. The blades and any grating or shredding disc should be sharp from the box and stay sharp over many years of use. The best rated food processors include accessories that can be used to shred, grate, julienne, and sometimes spiralize, your ingredients. Try to choose a processor which contains as many attachments as possible—some may include convenient storage units. Additional blades and discs can be ordered for the top brands. A plastic dough hook—if not already included—is definitely worth considering if you intend to make breads. Most of the best rated food processors will include some sort of chute on the lid for easier loading of ingredients. Feed tubes which are wider cut down on the need for chopping ingredients prior to putting them in the processor. Tubes with an adjustable size will enable you to add larger ingredients, like carrots or beefsteak tomatoes. A way of adding liquid to the bowl with the blades still running will also be handy for drizzling oil into an emulsion, like mayonnaise or making dressings. Adding liquid to the sauce as you blend it is much easier than having to remove the lid all the time. A few of the best small food processors feature innovations like a drizzle basin for making sauces. The size of the motor in your food processor will determine how quick you power through simple tasks. A strong motor will seize up less often and stand less chance of burning out. To prevent overworking the motor, don’t overfill the bowl above the recommended capacity. If you cook more often—or you prepare meals for large groups on a regular basis—you will need a hefty motor at the base of your food processor. Unfortunately, these will normally cost more, but if you want a reliable workhorse of a machine make sure you choose a model with more power. Food processors are generally quite easy to use. A good food processor is one which is easy to install the attachments, has simple controls, a choice of speeds and a pulse feature. A well-designed bowl that doesn’t leak and is easy to clean (preferably dishwasher safe) can be important for the longevity of your food processor. Ensure the food processor has safety features like an auto cut-off when the lid is opened, and never remove the blades or attachments without unplugging from the power first. Extra features, like a timer or cord storage can be helpful too. With so many food processors now available, it can be difficult to select the best one for your needs. They all have different sized motors, mixing bowls and come with many features, including, chopping, shredding, pureeing and even juicing. And they can range in price: from around $50 all the way up to several hundred dollars. How do you know which one is right for you? We have chosen five of the best food processors on the market and their individual features, to help you find the perfect machine to be your very own sous chef. This may not be the cheapest food processor we looked at, but you sure get a lot of bang for your buck. In our opinion, this is the best Cuisinart food processor you can currently buy. Cuisinart were the first domestic food processors in the US and remain a popular brand. What we really liked about this model is the simplicity of use. Two large levers switch the processor on and off for a continuous running of the motor, and a pulse option too. As well as the mixing/chopping blade, it comes with two shredding and slicing discs. Clean up is also easy: Cuisinart is the only manufacturer that actually encourages you to use a dishwasher to clean the individual parts. An extra wide food chute is placed at the rear of the bowl which makes it easy to see what’s going in the bowl as you process the foods. And because the tube is so wide, there’s no need to chop a block of mozzarella or large beefsteak tomato before processing them. Some people may bemoan the lack of an additional smaller bowl, but this would require an extra blade too. And although it doesn’t include a dough hook, in tests, the chopping/mixing blade included in the box made as good a job of mixing dough as specialized tools on other processors. Available in a choice of elegant steel finish, matt black or white, you can also purchase optional extras, i.e., a disc storage unit, different sized shredding disc and a whisk attachment. Pros: Simple controls, powerful 720-watt motor, 14-cup capacity, dishwasher safe parts, quiet in operation. Cons: Dough blade not included, not too good at chopping nuts, stem for discs can be hard to assemble. With a manufacturer’s recommended selling price of almost 400 US dollars, the Breville Sous Chef BFP800XL is the most expensive food processor on our list. For the extra cost you do, however, get the most powerful motor—1200-watts—and the largest bowl of any machine we looked at, with a 16-cup capacity. The motor even comes with a 25-year guarantee–so wearing it out won’t be an issue. 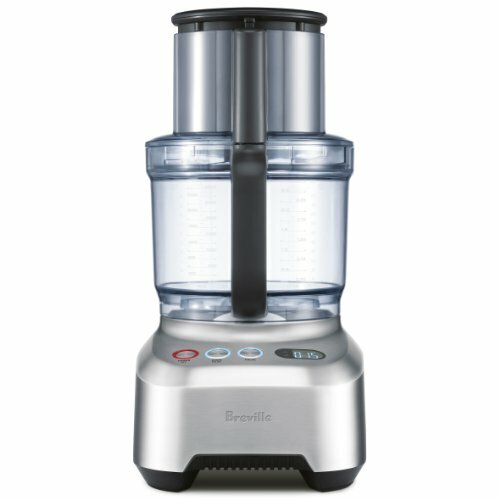 Breville have certainly put extra thought into the design of this food processor and made it simple to use and easy to clean. A feature we really liked was how the bowl sits flat on the motor unit without the usual opening for a shank, making it easier to clean and empty with no leaking. Instead a flat attachment with the shank inside the bowl enables you to measure ingredients directly into the bowl with the blades attached—even using a scale if needed—before effortlessly connecting the bowl to the base unit. Other useful design features include an LCD timer, which counts both up and down, and a retractable cord storage. Breville has included eight attachments as standard with the Sous Chef, all neatly contained in a specially designed caddy for easy storage. They comprise three different S-blades (large and small steel blades with a plastic one for kneading dough or pastry) and five specialized shredding/slicing discs. You also get a 2.5-cup mini bowl for smaller jobs. The main drawback to the Breville Sous Chef is the price. If you entertain larger groups on a regular basis or run a small cupcake business from home, then the Breville is an ideal choice. But if you only use your processor occasionally for cooking family meals, it may be overkill. Pros: Two sizes of bowl for big and small jobs, powerful 1200-watt induction motor, versatile with eight included attachments, wide feed tube, LCD timer, handy storage caddy. Cons: Expensive, loud motor, can get hot, causing causes problems when kneading dough or making pastry, large footprint and 18 inches high–you need a big kitchen to keep it on the countertop. From the largest food processor on our list, we move to the smallest. Counter-top space can be limited in small apartments–or maybe you live by yourself and simply don’t need a 14-cup processor. 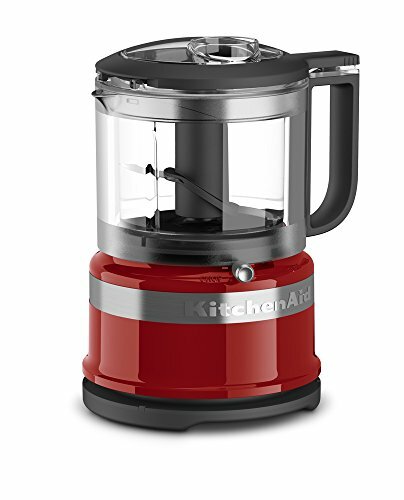 This 3.5-cup food processor from Kitchenaid offers more than enough power for smaller jobs when only feeding one or two. While several manufacturers include inexpensive mini-processors in their range, we found the KitchenAid to be the most sturdy and high quality. 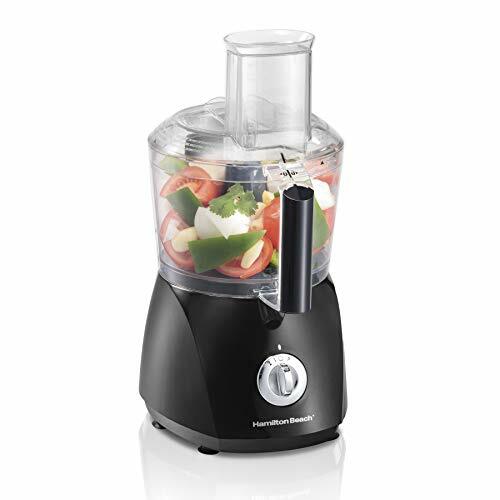 It chops vegetables quicker and more evenly than many other models and has additional design features that make it the best small food processor. The 240-watt motor can even handle chopping tough jumbo carrots and—as you won’t be using this smaller bowl for heavy tasks like bread dough—there’s little chance you will burn it out. An oversized handle makes for easier gripping and includes a button that you operate with your thumb to switch on, off or to pulse. A knob on the motor unit lets you choose between pureeing at a faster RPM or slowing it down for a chopping action. An indent in the lid allows for slowly adding liquids to make emulsion-based preparations, like vinaigrettes or mayonnaise. Compact and lightweight, this processor comes in a choice of 12 vivid colors to add a bit of cheer to your food prep. Although you won’t be able to knead bread or shred vegetables in the small bowl, this unit is ideal for smaller batch recipes, sauces and even pureeing baby food. All the parts are safe to put in a dishwasher for an easy clean, before storing away under the counter. Pros: Great for small jobs, simple push button operation, drizzle basin in the lid for emulsion sauces, small and light for easy storage, inexpensive. Cons: Only includes one single S-blade attachment, small 3.5-cup bowl and only 240-watt motor, limiting its ability to deal with large or difficult ingredients. 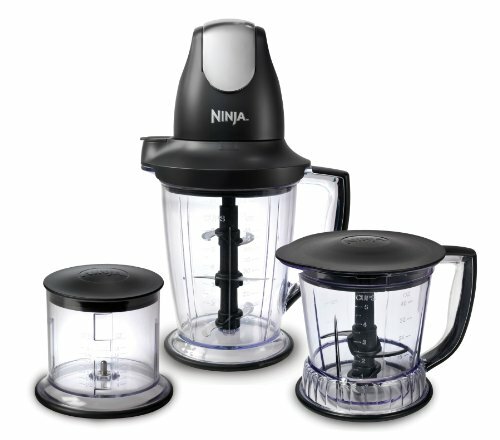 With three different sized bowls and a powerful “pod” motor, the Ninja Master Prep is the best food processor blender hybrid we looked at. Without a base unit which houses the controls, the motor housing fits on top of each bowl for operation. The 450-watt power pod comes with two attachments; a six-blade attachment—with stacked S-blades for the blender jug—and a smaller chopping blade assembly for the processor bowls. A large 48-ounce pitcher is ideal for making juices, shakes or sauces, while two smaller bowls, a 40-ounce and a 16-ounce jar are better for chopping tasks. Operation is as simple as attaching the power pod to your chosen jug and pushing down on a large button, pressing in shorter bursts to pulse or longer for blending. The hybrid design employed by the Ninja is ideal for making purees, smoothies, sauces and dips, but if you need slicing and shredding capabilities, you may be better choosing a more traditional food processor. The S-blades are only designed to chop or blend, with no additional slicing/grating discs for ingredients like cheese. Anything you add will get pulverized–it’s great for crushing ice. Although it may lack the versatility of more expensive dedicated food processors, at under $50, the Ninja Master Prep Pro is an ideal blender hybrid that chops food as well as it makes smoothies. The blending jug and bowls are solid, and both are microwave and dishwasher friendly. Pros: Choice of three bowls included, strong motor and blade assembly are good at chopping harder ingredients including ice, easy-to-use power pod design, good value for money. Cons: Only for chopping and blending–no shredding or slicing features, motor design means you have to take the jar off to add new ingredients. This 10-cup food processor from Hamilton Beach is a great choice for any home cooks who want a solid and simple machine without paying over the odds. This no-frills processor features a reasonable 525-watt motor which is powerful enough for most tasks, although it may struggle with mixing dough. The motor is comparable to many found in more high-end machines–don’t expect the same precision. There’s a high speed, low speed and pulse option for versatility, with a 10-cup bowl which is large enough for most jobs, yet still compact enough to store with ease. One handy built-in feature is a scraper integrated into the lid. This saves you having to scrape the insides of the bowl with a spatula. You simply turn the lever at the top of the lid to remove any ingredients that may be stuck to the sides of the bowl, either when the blades are still running or before removing the processed food. A stainless steel S-blade is included, along with two reversible shredding and slicing discs that are all dishwasher safe. The food processor is lightweight which does mean the motor can be very noisy, but—on the plus side—it’s not too large or heavy to move or store between uses. Handy suction cups attached to the base stop it from moving around the worktop as you use it. At under $50, this Hamilton Beach food processor will soon pay for itself in time saved in food prep. The results may not be as consistent as some premium processors we have looked at, and the motor may not be as durable–so be careful not to overwork it or burn it out. Pros: Very good value, integrated food scraper, decent 525-watt motor should handle the majority of jobs, the 10-cup bowl is large enough for most needs, reversible shredding discs included along with stainless steel S-blade. Cons: Motor can be noisy due to lightweight construction, feed chute is not as wide as others, not efficient at kneading dough, flimsy plastic components often too weak for the motor, replacement discs are around a quarter of initial purchase price. Although the Breville Sous Chef was the best performer of the food processors we looked at, it is a very expensive piece of equipment. To be honest, it’s more than most of us need. Before spending $400 on any appliance you need to ask yourself if you will make use of all the features and how often? It’s also a large and heavy machine which you would struggle to move and store between uses–have you really got the space in your kitchen for it? If you are looking for the best food processor for your dollar, the Cuisinart DFP-14BCNY 14-Cup Food Processor is one we highly recommend. Cuisinart is the company that has made food processors a standard appliance in many American kitchens and continues to update its products and innovate. If you need to get a lot of preparation done in a short amount of time, then the Cuisinart is an ideal option. 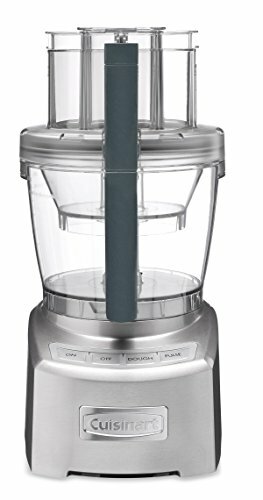 A large bowl and extremely powerful motor unit makes this Cuisinart’s top rated-food processor.